The rain didn’t keep the buyers away from our annual Dad’s and Donuts event. Due to the success of this event and produce sales, the garden sold a record amount of pumpkins and produce totalling more than $1,000. The proceeds will help fund PTO programs, such as Art Masters, John Yeiser, Composer Countdown and Physical Education. Thank you to the garden volunteers that made this all possible. And we’d like to give a special shout out to Sofie Ngeth, John O’Brien, Ellen Kinoshita, Julie Ward and her husband, Jennifer Whyte, Caroline Demmerle and Joyce Howie. 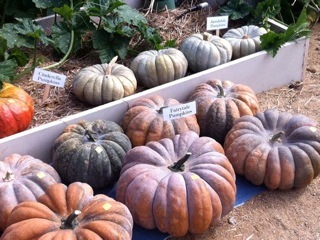 The Garden will be selling pumpkins until they are gone. Produce sales are Thursdays after school, or we’d be happy to meet potential buyers in the garden at a time convenient for all. We’re also still selling raffle tickets for the Garden Starter Kit and the 78-pound pumpkin. The raffle tickets are $1 each, or free with a produce purchase of $1 or more. For details, contact Naomi Dei Rossi.